Children aged 6 - 12 years take 1 teaspoon (5ml) daily. Shake bottle well before use. Once opened keep refrigerated and use within 4 months. As with other food supplements, seek professional advice before giving to your child if they are under medical supervision or suffer from food allergies. 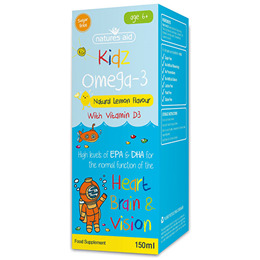 Below are reviews of Natures Aid Kidz Omega-3 - 150ml by bodykind customers. If you have tried this product we'd love to hear what you think so please leave a review.